A Year of Firsts, and Historic Turnout! In this historic election year, 49% of eligible voters voted in the first midterm election ever to have more than 100 million voters. We haven’t had a turnout percent this high since 1966, and you’d have to look all the way back to 1914 to find an election with more than 50% participation. With some votes in GA, TX, and FL still being counted there’s a chance this election will break that record. 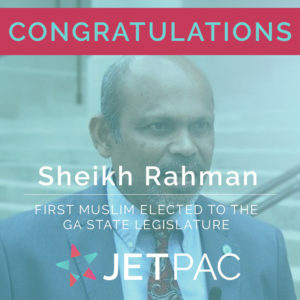 It was a record year for Muslim involvement, too. 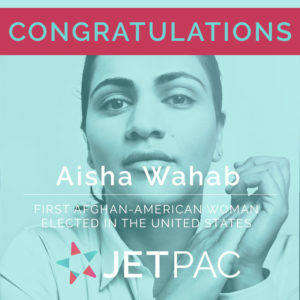 Jetpac has confirmed at least 128 American Muslims ran for office in this cycle. Numbers haven’t been that high since 2000, when about 700 Muslims ran, and 153 were elected. 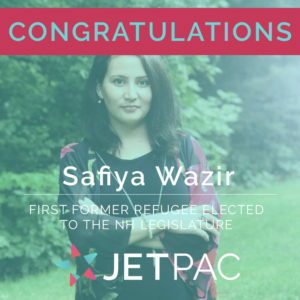 Jetpac is working on a full report to be released next week, in partnership with CAIR. 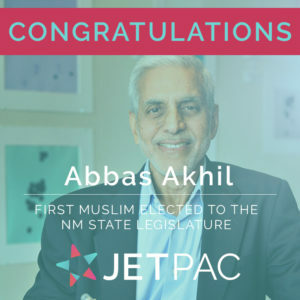 Below, we’ve broken down the campaigns of American Muslims across the country at the Federal/Statewide, State Legislative, County, Judiciary, and Municipal levels. Click the links to jump to those sections. We’ve pulled this information from a number of sources—let us know if we’ve made a mistake, or forgotten to add anyone. We’ll be updating the list as we get more results. We want to throw out an honorable mention here to Ammar Campa-Najjar, who lost his Congressional bid against Duncan Hunter (R) in CA’s 50th Congressional District. 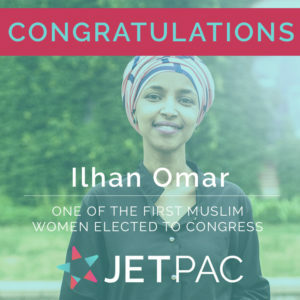 Throughout his campaign, Campa-Najjar was attacked as being Muslim—despite having converted to Christianity in high-school—and Hunter, who was indicted for alleged campaign finance abuses, ran one of the most anti-Muslim smear campaigns in recent history against Campa-Najjar. Campa-Najjar received approximately 46% of the vote on Tuesday, according to unofficial results. 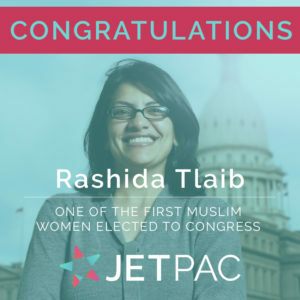 Of the above wins, we have a lot of firsts for American Muslims: Rashida Tlaib is the first Palestinian-American woman to be elected to Congress, Ilhan Omar will be the first Somali woman, and—without getting into the exact times their races were called—they’re both the first American Muslim women to be elected as members of the House of Representatives. 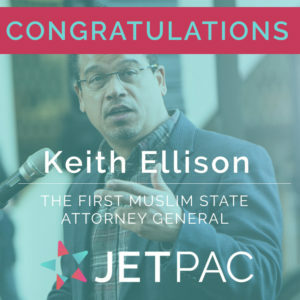 Keith Ellison will be the first American Muslim State Attorney General, and the first American Muslim elected to statewide office. While we didn’t get all the wins we wanted, it can’t be stressed enough that each and every one of these candidates had a victory—regardless of the numbers that came in yesterday. These are our community leaders, and they fought so hard for their voices to be heard. Congratulations to each and every one of you. Quick note: Amir Malik’s race in MN’s 37B District is within 100 votes. While the unofficial results are predicting a win for his opponent, it’s still very close. Have we missed anyone? Made a mistake? Let us know! Maybe it doesn’t need to be said, but it should be: everyone on this list did an amazing job organizing their communities. 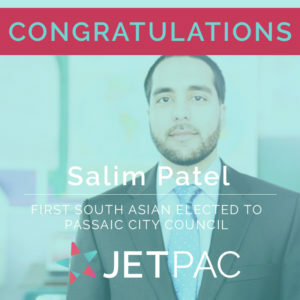 These county-level races are tough, and you all deserve a round of applause for your work! An asterisk (*) denotes that this election result may have been from earlier in 2018. We’re still waiting on results for some local elections—stay tuned. Although there are highlighted “firsts” above, they’re just a selection based on news media we could find. Every single one of these candidates did an amazing job as organizers! If we’ve missed anyone, or made a mistake, please let us know! 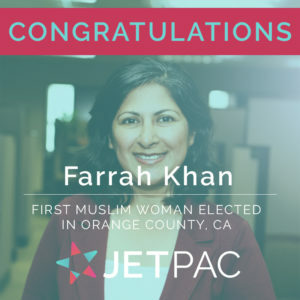 We partnered with CAIR to produce a report on American Muslim Election victories and voter attitudes. Click below to check it out!